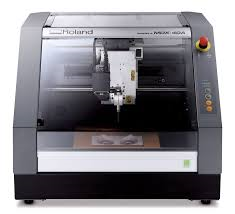 【Roland DG】MDX-40A | Products （Processing Equipment ）| MASS CO., LTD.
An intuitive and easy-to-use Subtractive Rapid Prototyping (SRP) device, the small footprint MDX-40A fits into any Fab Lab, workshop, office or classroom and allows both novice and advanced users to create precision 3D models. Built for designers, engineers and students who work in fast-paced environments, the speed, versatility and convenience of the MDX-40A put you in complete control. X, Y, and Z strokes 12 (X) x 12 (Y) x 4-1/8 (Z) in. Table size 12 (W) x 12 (D) in. Dimensions 26-3/8 (W) x 29-15/16 (D) x 21-13/16 (H) in.